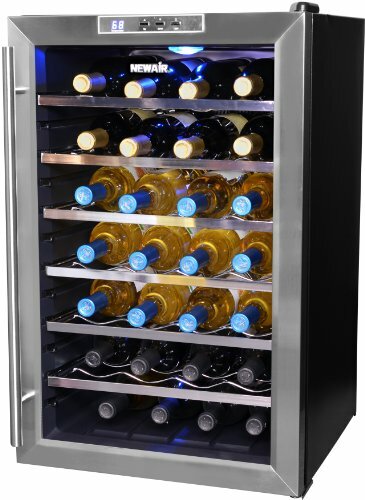 Franklin Chef Wine Cooler Refrigerators enable you to store your colletcion of wine bottles in within proper storage conditions: cool, dark, no vibration. In the smallest of the Franklin Chef wine fridges you will be able to store up to 20 bottles, whereas the largest model will be accommodating 100 bottles of wine. The reviews and ratings of Franklin Chef wine coolers point out that you have some good user-friendly wine refrigerators to select from. an adjustable temperature range of 46°F to 60°F. You will also find that the rack stability is excellent and the freestanding wine cellar units are the perfect cabinets for storing white, red and sparkling wines. When the occasion demands, you will always have “ready to serve” wines handy. Your guests will love to sip on wines that have retained their tastes and are chilled to ideal temperature. It is very important to keep your wines in the right condition so that no mess is done with their tastes and quality. Chill and keep the wine bottles properly stored with the help of wine fridges, that way you will be able to keep intact the quality of the wines and serve them chilled to your guests whenever you require them. 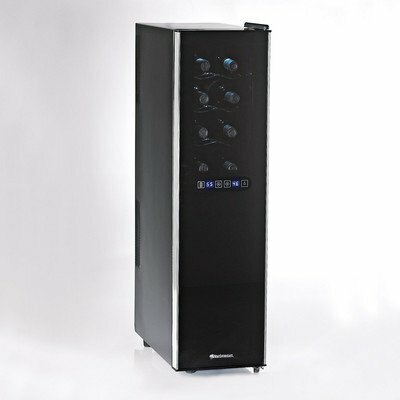 Franklin Chef wine coolers make it possible for you to store wine as a wine connoisseur. The optimum temperature is maintained. For humidity control Franklin Chef wine fridges are equipped with drip trays that collect condensation that is evaporated by the heat of the compressor trying to maintain a constant humidity of level around 50%. 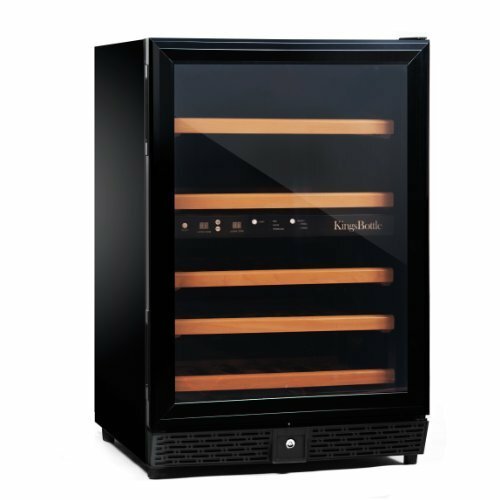 These wine fridges are very handy in storing your wines for day to day use or for showing-off your wine collection when you have guests coming over to your place. The sturdy chromed racks of Franklin Chef wine coolers can be pulled out one-third for displaying the wine bottles. The digital thermometer is actually placed onto the door of the wine chiller and you also have a dark interior that will let the wines be in a favorable condition. Choose from the many wine coolers that Franklin Chef have in store for you. Depending upon the number of wine bottles that you plan to store in the unit, pick a model that is the most suitable for your needs. The only moving part is the fan for circulating the air.The mechanical temperature control allows you to adjust temperature inside the cabinet 18°F lower than the exterior ambient temperature. So if you put the cooler in a 72°F (22°C) room you can produce maximum 54 °F (12°C) inside the unit. It also means that for efficient cooling you mustn’t place the cooler in a room with more than 77°F (25 °C) temperature. The black metal cabinet has black interior and contains 5 wavy, slide-out wire shelves. The tempered, double pane glass door offers full view of the stored wines. The compact, lightweight wine cooler has the benefit of easy transportation. Lack of numerous moving parts ensures long life and virtually noiseless operation. TIP: The Viking 24 Bottle Undercounter Wine Cellars are more expensive options with slightly larger storage capacity. Price: US$ 200 – 250 (US$ 10.0 – 12.5 per bottle). 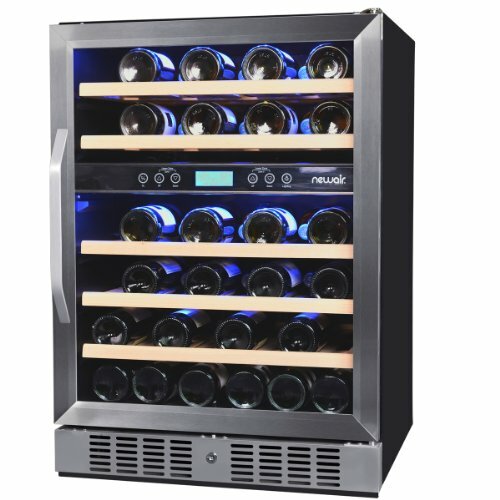 This dual temperature zone wine cooler refrigerator has two separate compartments each capable of storing 18 bottles of wine. Its dimensions (W: 23.5 “, H: 33.4 “, D: 23.5 “) and the front venting allow the unit to be conveniently built under the counter. Other features are same as that of the 100 bottle wine fridge by Franklin Chef described below. Read a complete review of the Franklin Chef FWC36 Wine Cooler here. Price: cc. US$ 700 – 900 (US$ 19.44 – 26.47 per bottle). Find out more dual zone wine refrigerators. This dual zone wine cooler has two compartments for storing both red and white wines at their recommended temperatures. The two zones have their own digital controls and displays for setting temperature between 46°F – 64°F and monitoring the conditions. You can also turn on or off the interior lights in both zones independently. The fridge can be used as freestanding or built in your kitchen cabinetry. You can store 100 bottles of wines (50 in each compartment on the 20 wire racks that can be pulled out to 1/3. Other standard accessories are the 2 plastic drip trays for collecting condensed water. The two double pane glass doors with stainless steel handles have their own locks and keys which come handy if you use it in a restaurant, bar or if you want to prevent your kids from opening the wine refrigerator. The Franklin Chef FWC100 is a great model if you look for a commercial wine cooler for your restaurant or wine bar. See other 100-Bottle Wine Refrigerators. 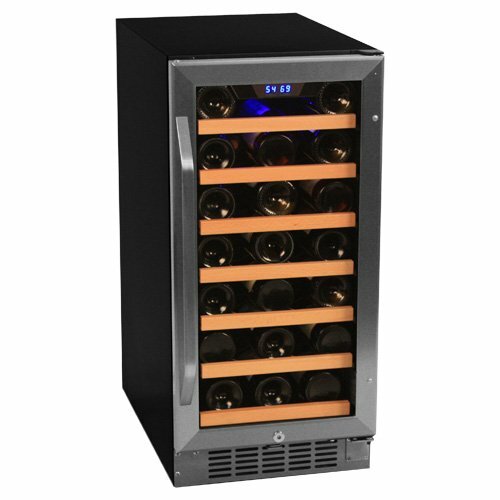 Take a look at some other Recommended Commercial Wine Coolers. Price: US$ 900-1100 (US$ 9 – 11 per bottle). See other Built-In Wine Coolers. This single zone wine refrigerator can store up to 120 wine bottles on 10 slide-out chrome racks that you can pull out to one-third to access the bottles. Since it has front venting it’s great for built-in use but you can place it as freestanding as well. The easy-to-use digital controls allow you to set temperature between 48°F – 60°F. The black cabinet has black framed dual pane, amber tinted glass door, with stainless steel vertical handle. This sturdy fridge is designed for outdoor use. It comes with stainless steel body with triple pane, tinted, glass double door. Both door wings have their own lock and key and large, stainless steel bar handle. The fridge has two zones – right- and left-hand – for which you can individually adjust temperature between 36°F – 64°F. In The Franklin Chef FBC360D outdoor beverage cooler you can store up to 18 bottles of wine and 36 cans of beverages on 6 adjustable chrome-plated wire racks, 3 chrome-plated flat shelves and in a chrome plated wire basket. Each compartment has its own digital control panel and interior light integrated in the cabinet ceiling. Adjustable legs and wheels for easy installation and transportation and a plastic cover for protection are standard accessories. The front ventilation of the cooler allows you to install it either as built-in or freestanding. The appliance plugs into a standard power outlet (115 V/60 Hz). The Franklin Chef 18-bottle outdoor wine cooler has received mixed reviews. One customer said that it is the best-value outddoor beverage cooler and works very well. Another customer however has had a bad experience with this unit. It stopped working after 8 months and though the repair service tried to repair it several times the cooler failed to work. After 1 year the manufacturer said that the warranty had expired and they wouldn’t replace the faulty unit. Note that Franklin Chef makes wine coolers for Home Depot under the Everstar name. TIP: Magic Chef wine coolers are affordable units in various sizes sold also by Home Depot. For an indoor beverage cooler take a look at the GE Monogram Undercounter Wine and Beverage Center.